Looking for the perfect way to represent your spa online? Look no more! This new, striking, smooth-functioning WordPress spa theme is a fully responsive theme that is designed specifically to be used with spa websites. Why only offer a great in-person experience, when you can have a website that does the same for you in the virtual space? 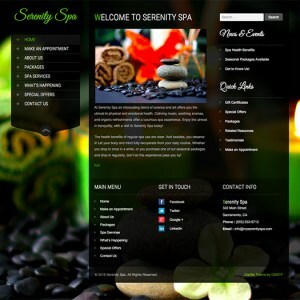 That's exactly what this new WordPress spa theme will do for you - enthrall your potential customers. And even better, it looks great on a variety of devices and is easy to manage! Interested in getting free installation and setup and/or logo/button customization included with your purchase? Just ask us!